← You can do it! Most people think that bullying is cornering someone in a corridor of a school and taking away their lunch or pocket money. Gone are the days when this was the only type of bullying. Wikipedia defines ‘bullying’ as a form of aggressive behaviour manifested by the use of force or coercion to affect others, particularly when the behavior is habitual and involves an imbalance of power. Every one of us has experienced bullying at some point of our life. It may have been someone harassing or hitting you, or possibly someone making fun of your religion, gender or ethnicity, or even people spreading rumours about you behind your back. All these actions constitute bullying and should be nipped in the bud. Bullying can occur in any context in which we interact with each other. There are 5 main types of bullying behaviour, all of which include a certain degree of intimidation. 1. 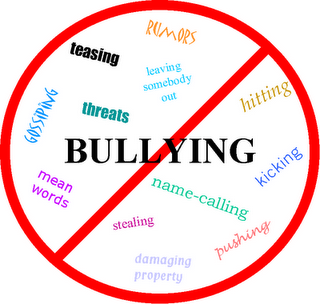 Physical bullying, when someone assaults, hits, kicks, punches or otherwise physically attacks another. Taking someone’s lunch away, breaking someone’s possession or slashing another person’s tyres constitutes physical bullying. 2. Verbal bullying, which includes making fun of someone’s race, look, hair colour, personal preference, physical ability or background. 3. Social alienation, when a person is excluded from a particular social group on purpose. 4. Indirect bullying, which includes spreading rumours or telling others something that was shared with you in private. 5. Cyber bullying, where threatening messages or emails are sent to another via various electronic devices and cell phones or creating derogatory posts in social media. If you are bullied, find the courage to stand up for yourself. Make notes of the behaviour, seek help, consult others! On the other hand, if you see someone else being bullied by any means – help them in any way you can. Eradicate bullying and we will be a much happier society! I am a mother, a senior franchising and commercial lawyer, a writer and a social media enthusiast. I live a very busy lifestyle but believe that you need to take time to ‘stop and smell the roses’. I also believe in taking educated risks and celebrating all achievements in life, regardless of how big or small they are. I am a lateral thinker and an optimist. My goal in life is to ensure the saying “we make our own destiny” becomes a reality. This entry was posted in Business, Family, General Reflections, Parenting, Social Media, Uncategorized and tagged aggressive, assault, background, bullied, bullying, cell phone, coercion, derogatory, email, ethnicity, force, gender, happy, Harvey S. Firestone, help, imbalance, intimidation, life, nip in the bud, phone, physical, race, rumour, school, seek help, silence, slash, social media, society, threat, threatening, types of bullying, verbal, wikipedia, words of wisdom. Bookmark the permalink. 1 Response to Say no to bullying! Researchers are saying that by allowing kids to have all that they desire is only contributing to the problem of bullying! Great article ! People need to take a stand! Can you be selfish in a relationship?